As Founder & CEO of Connectworxs, Graham is passionate about helping organizations achieve growth by creating the right data-driven culture. Graham began his career as a Royal Marines Officer, specializing in intelligence. This experience led him to the belief that teams that ask better questions to data will fuel growth for their organizations. He believes that the role of leadership in the information age is to provide a clear and compelling purpose that can act as a handrail for teams to plan and execute strategy against, using data. Seeing what’s out there and what may cause problems before it does is crucial, but it’s not something that everyone does. Even worse, it’s not something that every business does. In order to succeed in today’s global market, any business needs to be able to anticipate problems, react to them quickly, and have a solution in place as soon as possible. Without these plans … well, the business just falls apart at the first sign of adversity. 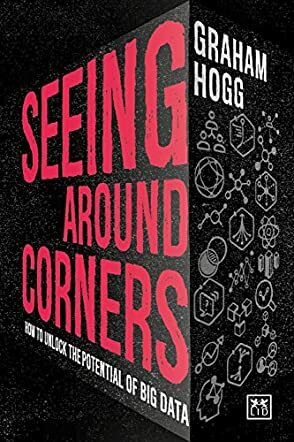 With Seeing Around Corners: How to Unlock the Potential of Big Data by Graham Hogg, you’ll learn more about how to plan for anything and how to accomplish your goals and get rid of siloed thinking that can slow down your organization and your capabilities. There are plenty of steps involved in making accurate and fortuitous business decisions, but even those with the best of intentions can make mistakes along the way because they’re looking at the wrong things. This book is all about what you should be looking at to succeed in your business, with real life examples and case studies from other businesses that have made it work (or not). It’s a great way for any business person to start taking a closer look at what they’ve been doing right and wrong, and what they should be doing next to continue improving. Looking to the future is key and Seeing Around Corners is all about recognizing what the future holds and preparing for it before it gets here, instead of after it’s already passed you by. From building strong teams, getting the right data and understanding where your analysis should be to discovering the right way to provide support to those in need, this is a business book you definitely need.